Yampolsky IV, Kislukhin AA, Amatov TT, Shcherbo D, Potapov VK, Lukyanov S, Lukyanov KA. Synthesis and properties of the red chromophore of the green-to-red photoconvertible fluorescent protein Kaede and its analogs. Mishin AS, Subach FV, Yampolsky IV, King W, Lukyanov KA, Verkhusha VV. The First Mutant of the Aequorea victoria Green Fluorescent Protein That Forms a Red Chromophore. Cox LJ, Hengst U, Gurskaya NG, Lukyanov KA, Jaffrey SR.
Intra-axonal translation and retrograde trafficking of CREB promotes neuronal survival. Tereshina MB, Belousov VV, Zaraisky AG. Study of the mechanism of Ras-dva small GTPase intracellular localization. Pletneva NV, Pletnev SV, Chudakov DM, Tikhonova TV, Popov VO, Martynov VI, Wlodawer A, Dauter Z, Pletnev VZ. Three-dimensional structure of yellow fluorescent protein zYFP538 from Zoanthus sp. at the resolution 1.8 angstrom. Genetically encoded intracellular sensors based on fluorescent proteins. Using photoactivatable fluorescent protein Dendra2 to track protein movement. Oswald F, Schmitt F, Leutenegger A, Ivanchenko S, D'Angelo C, Salih A, Maslakova S, Bulina M, Schirmbeck R, Nienhaus GU, Matz MV, Wiedenmann J.
Schuttrigkeit TA, Feilitzsch T, Kompa C, Lukyanov KA, Savitsky A, Rosch N, Voityuk AA, Michel-Beyerle ME. Femtosecond study of superlinear light induced fluorescence increase of the coral protein asFP595. Lukyanov KA, Chudakov DM, Fradkov AF, Labas YA, Matz MV, Lukyanov S.
Discovery and properties of GFP-like proteins from nonbioluminescent anthozoa. Evdokimov AG, Pokross ME, Egorov NS, Zaraisky AG, Yampolsky IV, Merzlyak EM, Shkoporov AN, Sander I, Lukyanov KA, Chudakov DM. Structural basis for the fast maturation of Arthropoda green fluorescent protein. Chudakov DM, Chepurnykh TV, Belousov VV, Lukyanov S, Lukyanov KA. Fast and precise protein tracking using repeated reversible photoactivation. Field SF, Bulina MY, Kelmanson IV, Bielawski JP, Matz MV. Adaptive evolution of multicolored fluorescent proteins in reef-building corals. Photoswitchable cyan fluorescent protein as a FRET donor. Lukyanov KA, Chudakov DM, Fradkov AF, Labas YA, Matz MV and Lukyanov SA. Discovery and properties of GFP-like proteins from non-bioluminescent Anthozoa. Chudakov DM, and Lukyanov KA. Using photoactivatable GFPs to study protein dynamics and function. Shkrob MA, Yanushevich YG, Chudakov DM, Gurskaya NG, Labas YA, Poponov SY, Mudrik NN, Lukyanov S, Lukyanov KA. Far-red fluorescent proteins evolved from a blue chromoprotein from Actinia equina. Lukyanov KA, Chudakov DM, Lukyanov S, Verkhusha VV. Yampolsky IV, Remington SJ, Martynov VI, Potapov VK, Lukyanov S, Lukyanov KA. Synthesis and properties of the chromophore of the asFP595 chromoprotein from Anemonia sulcata. Quillin ML, Anstrom DM, Shu X, O'Leary S, Kallio K, Chudakov DM, Remington SJ. Kindling fluorescent protein from Anemonia sulcata: dark-state structure at 1.38 A resolution. Yanushevich YG, Shagin DA, Fradkov AF, Shakhbazov KS, Barsova EV, Gurskaya NG, Labas YA, Matz MV, Lukyanov KA, Lukyanov SA. Spectral diversity among the members of the family of Green Fluorescent Protein in hydroid jellyfish (Cnidaria, Hydrozoa). Remington SJ, Wachter RM, Yarbrough DK, Branchaud B, Anderson DC, Kallio K, Lukyanov KA. zFP538, a yellow-fluorescent protein from Zoanthus, contains a novel three-ring chromophore. Verkhusha VV, Chudakov DM, Gurskaya NG, Lukyanov S, Lukyanov KA. Common pathway for the red chromophore formation in fluorescent proteins and chromoproteins. Chudakov DM, Verkhusha VV, Staroverov DB, Souslova EA, Lukyanov S, Lukyanov KA. Photoswitchable cyan fluorescent protein for protein tracking. Bulina ME, Lukyanov KA, Yampolsky IV, Chudakov DM, Staroverov DB, Shcheglov AS, Gurskaya NG, Lukyanov S.
New class of blue animal pigments based on Frizzled and Kringle protein domains. Pakhomov AA, Martynova NY, Gurskaya NG, Balashova TA, Martynov VI. Photoconversion of the chromophore of a fluorescent protein from Dendronephthya sp. Shagin DA, Barsova EV, Yanushevich YG, Fradkov AF, Lukyanov KA, Labas YA, Semenova TN, Ugalde JA, Meyers A, Nunez JM, Widder EA, Lukyanov SA, Matz MV. GFP-like proteins as ubiquitous Metazoan superfamily: evolution of functional features and structural complexity. The molecular properties and applications of Anthozoa fluorescent proteins and chromoproteins. Verkhusha VV, Matz MV, Sakurai T, Lukyanov KA. GFP-like fluorescent proteins and chromoproteins of the class Anthozoa. Martynov VI, Maksimov BI, Martynova NY, Pakhomov AA, Gurskaya NG, Lukyanov SA. A purple-blue chromoprotein from Goniopora tenuidens belongs to the DsRed subfamily of GFP-like proteins. 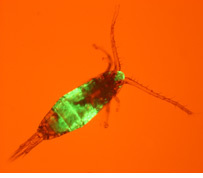 Use of green fluorescent protein (GFP) and its homologs for in vivo protein motility studies. Yanushevich YG, Gurskaya NG, Staroverov DB, Lukyanov SA, Lukyanov KA. A natural fluorescent protein that changes its fluorescence during maturation. Gurskaya NG, Fradkov AF, Pounkova NI, Staroverov DB, Bulina ME, Yanushevich YG, Labas YA, Lukyanov S, Lukyanov KA. A colourless green fluorescent protein homologue from the non-fluorescent hydromedusa Aequorea coerulescens and its fluorescent mutants. Bulina ME, Verkhusha VV, Staroverov DB, Chudakov DM, Lukyanov KA. Hetero-oligomeric tagging diminishes non-specific aggregation of target proteins fused with Anthozoa fluorescent proteins. Chudakov DM, Belousov VV, Zaraisky AG, Novoselov VV, Staroverov DB, Zorov DB, Lukyanov S, Lukyanov KA. Kindling fluorescent proteins for precise in vivo photolabeling. Chudakov DM, Feofanov AV, Mudrik NN, Lukyanov S, Lukyanov KA. Chromophore environment provides clue to kindling fluorescent protein riddle. Fradkov AF, Verkhusha VV, Staroverov DB, Bulina ME, Yanushevich YG, Martynov VI, Lukyanov S, Lukyanov KA. Matz MV, Lukyanov KA, Lukyanov SA. Family of the green fluorescent protein: journey to the end of the rainbow. Yanushevich YG, Bulina ME, Gurskaya NG, Savitskii AP, Lukyanov KA. Key amino acid residues responsible for the color of green and yellow fluorescent proteins from the coral polyp Zoanthus. Barinova I, Zhexembekova M, Barsova E, Lukyanov S, Heberle-Bors E, Touraev A.
Antirrhinum majus microspore maturation and transient transformation in vitro. Bulina ME, Chudakov DM, Mudrik NN, Lukyanov KA. Interconversion of Anthozoa GFP-like fluorescent and non-fluorescent proteins by mutagenesis. Labas YA, Gurskaya NG, Yanushevich YG, Fradkov AF, Lukyanov KA, Lukyanov SA, Matz MV. Diversity and evolution of the green fluorescent protein family. Terskikh AV, Fradkov AF, Zaraisky AG, Kajava AV, Angres B. Analysis of DsRed Mutants. Space around the fluorophore accelerates fluorescence development. Yanushevich YG, Staroverov DB, Savitsky AP, Fradkov AF, Gurskaya NG, Bulina ME, Lukyanov KA, Lukyanov SA. A strategy for the generation of non-aggregating mutants of Anthozoa fluorescent proteins. Gurskaya NG, Savitsky AP, Yanushevich YG, Lukyanov SA, Lukyanov KA. Color transitions in coral's fluorescent proteins by site-directed mutagenesis. Gurskaya NG, Fradkov AF, Terskikh A, Matz MV, Labas YA, Martynov VI, Yanushevich YG, Lukyanov KA, Lukyanov SA. GFP-like chromoproteins as a source of far-red fluorescent proteins. Martynov VI, Savitsky AP, Martynova NY, Savitsky PA, Lukyanov KA, Lukyanov SA. Alternative cyclization in GFP-like proteins family. The formation and structure of the chromophore of a purple chromoprotein from Anemonia sulcata. Yarbrough D, Wachter RM, Kallio K, Matz MV, Remington SJ. Refined crystal structure of DsRed, a red fluorescent protein from coral, at 2.0-A resolution. Terskikh A, Fradkov A, Ermakova G, Zaraisky A, Tan P, Kajava AV, Zhao X, Lukyanov S, Matz M, Kim S, Weissman I, Siebert P.
"Fluorescent timer": protein that changes color with time. Lukyanov KA, Fradkov AF, Gurskaya NG, Matz MV, Labas YA, Savitsky AP, Markelov ML, Zaraisky AG, Zhao X, Fang Y, Tan W, Lukyanov SA. Natural animal coloration can be determined by a nonfluorescent green fluorescent protein homolog. Fradkov AF, Chen Y, Ding L, Barsova EV, Matz MV, Lukyanov SA. Novel fluorescent protein from Discosoma coral and its mutants possesses a unique far-red fluorescence. Matz MV, Fradkov AF, Labas YA, Savitsky AP, Zaraisky AG, Markelov ML, Lukyanov SA. Fluorescent proteins from nonbioluminescent Anthozoa species.